Every Sunday night loyal fans of AMC's The Walking Dead can usually be found drowning their sorrows in booze whilst sobbing over the loss of yet another beloved character. Of course, it was just a matter of time before someone decided to pay homage to the popular show but Dock Street Brewing Co. may have just taken this zombie trend to the next level. The brainchild of by Head Brewer Justin Low and Brewery Representative Sasha Certo-Ware, the aptly named "Dock Street Walker" beer is an American Pale Stout that is brewed with...wait for it...real brains. Before you freak out and grab your zombie survival kit don't worry, it's not human brains it's just smoked goat brains. Did we mention the brew is also made with organic cranberries to get that perfectly bloody hue? Dock Street Walker is 7.2% alcohol by volume so after knocking back a few don't be surprised if you end up dragging yourself around like a walker on the prowl. 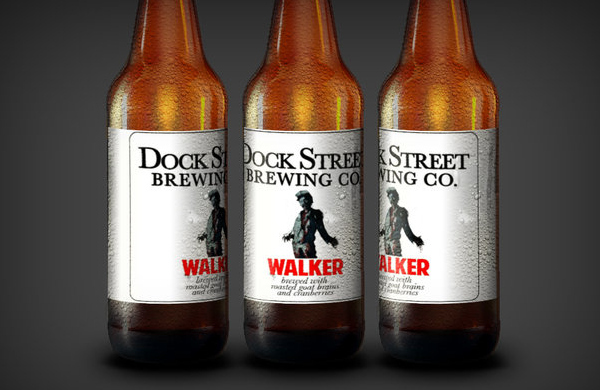 In honor of The Walking Dead's season finale Dock Street Walker will make its debut on tap at Dock Street Brewing Co. on March 30. If you happen to be in the West Philly area have a brainy brewski for us, we'll just have to celebrate at home with these zombie jello shots. Unnngggghhhhh.